I applaud those people who walk, run, and bike, but all of those activities are so boring to me that I won’t ever exercise if they’re my only options. I prefer exercise classes, yoga, pilates, zumba, etc. For a long time I thought the only way to participate in those activities was to join a gym, but I’ve found out in the past year that isn’t the case. Here are some places you might not have thought to look. 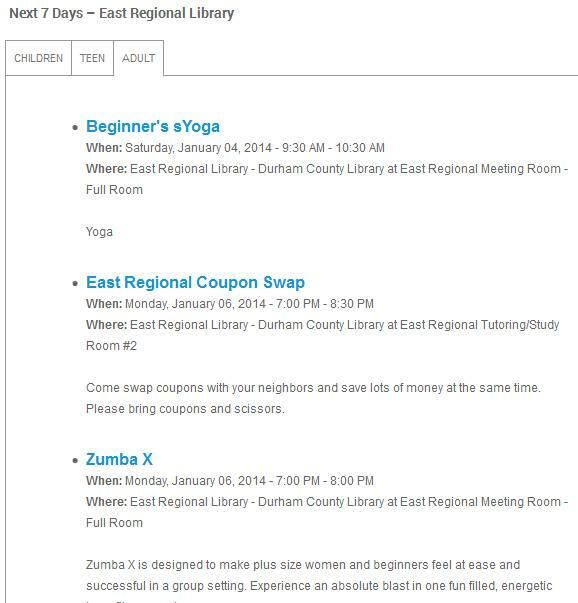 I’m not sure what any of these programs have to do with literacy, but I’m glad my library is offering exercise classes for free. No, I’m not talking about checking out books on exercise, although there are certainly some good how-to books and magazines at the library that could help you build an exercise routine at home. Realistically, most people aren’t motivated enough to do that. However, your public library just might be offering free exercise classes. I was shocked to find out that my local library offered both free zumba and yoga once a week in its multipurpose room. Two of nearly a hundred workout videos available at my library. Besides live classes, the library is a great source for exercise videos. 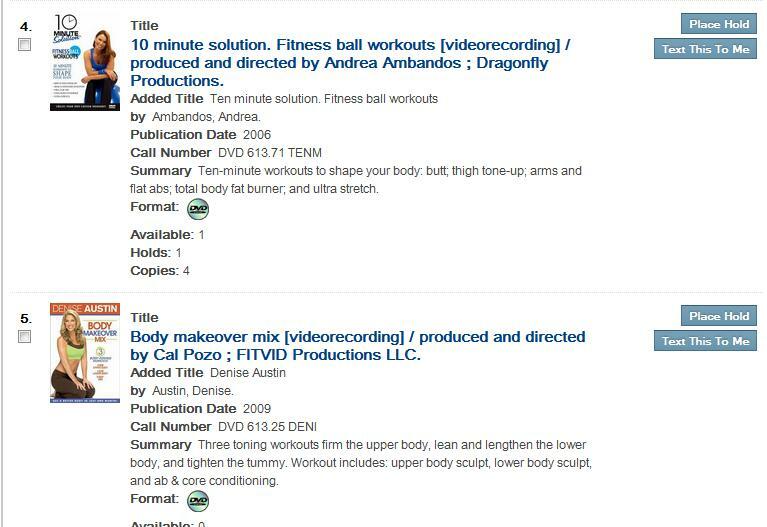 A quick search of the Durham library catalog revealed they had nearly a hundred different workout DVDS. Pilates, yoga, tai chi—you name it—they’ve got it. You know how Leslie Knope is always trying to get the people of Pawnee to stop eating Sweetems candy and drinking gallon sized sodas and get healthy? Amy Poehler and the cast of Parks and Rec make those situations into hilarious comedy, but the plot is based on real life. Chances are your city’s parks and recreation department is trying to launch programs to make the population healthier. Like all government programs, though, they’re probably terrible about advertising them. Part of a perfectly lovely flyer advertising the City of Durham’s gyms & pools I have never, ever seen displayed anywhere. For the whole flyer, click the link below. Visit your city or county government’s webpage and root around a little bit. You might find more free exercise classes being held in community centers, parks, churches, or other local gathering places. If you live in a city of a good size, you might even have gyms owned by the city. 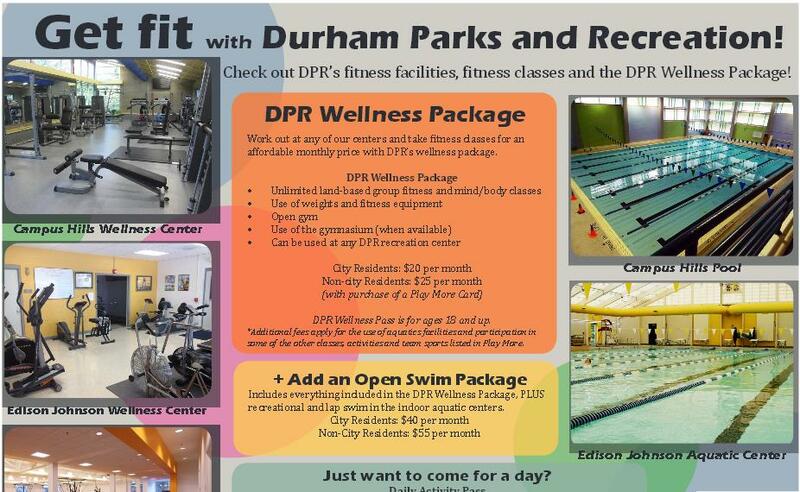 Durham has a network of gyms, pools, and parks all owned by the city. They offer dozens of exercise classes, team sports, after school programs for kids, etc. They put out a catalog a few times a year listing the various options. While there are fees for some of the classes, it’s cheaper for Durham residents, and there are no contracts like with gyms. You can drop in on a class whenever you like, and they cost a fraction of what you would pay at a studio. Usually they’re just a couple of dollars a class. A monthly pass to use all of the gym equipment and take all of the classes you want costs just $20. While the energy of a class full of people can be fun, there’s also something to be said for exercising in the privacy of your own home. Especially when you are just starting to get in shape, you can feel awkward and don’t always want an audience. I also like that it takes less time because you don’t have to drive there and back. I like exercise videos, but after a while I get bored doing the same one over and over. Buying video after video can get expensive, too. I recently discovered a treasure trove of online exercise videos that you can stream. I especially like both of these options below because they focus more on health and less on appearance. Some so called “fitness” websites have a tendency to make me just feel worse about myself. Gaiam, the exercise equipment maker, also has produced hundreds of workout programs. They have their own exercise channel. I own a balance ball set from them, and enjoyed the video that came with it, so I looked to see if they had any more stuff. I found you can subscribe to their exercise channel online for $10 a month. That’s pretty good, but I’m cheaper than even that, so with a little digging, I discovered that the Gaiam library is available on Hulu. 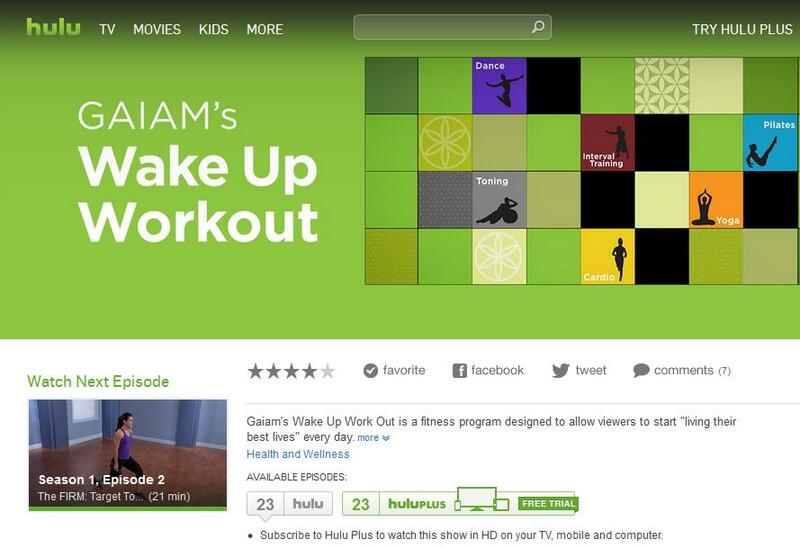 Regular Hulu users can access their Wake-up Workouts and a number of good clips. Hulu Plus subscribers can access the whole Gaiam library. A subscription to Hulu Plus is cheaper than Gaiam at $7.99 a month, so that seems like a no brainer to me. I just use the free videos. When looking for a good upper body workout, I also came upon Fitnessblender.com. It’s a marvelous website put together by a husband and wife team that offers full length workout videos for free. They believe that good quality health and exercise instruction should be available to anyone, regardless of income. The videos are great. It’s like having a personal trainer talking to you the whole time, and there’s no obnoxious music. You can search for workouts based on type (yoga, cardio, balance, etc. ), area (upper body, lower body, etc. ), difficulty level, length in minutes, or calories burned. They also have a video section about food and nutrition. A lot of zumba instructors offer classes places other than gyms for reasonable rates. I often see zumba advertised for $5 a class. They can be held in anything from roller rinks to high school gyms. Keep your eyes out for flyers on community bulletin boards, but also look for ads on meetup.com and Craigslist. Keep your eyes peeled for deals like this community class from Durham Yoga Company. Lots of studios have something similar. 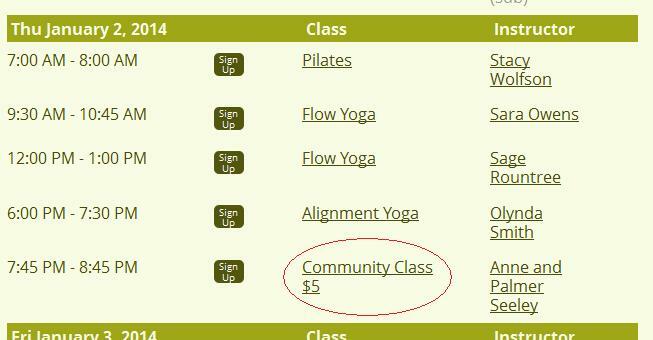 A lot of yoga studios also offer a community class. This is generally a lower cost class held at least once a week as a service to the community. Often community classes are taught by new yoga instructors who have to accumulate a certain amount of classroom hours before they are fully certified. I go to a community yoga class at Durham Yoga Company’s beautiful downtown studio. The instruction is always top rate, and it only costs me $5 each time instead of the normal rate of $15. I feel so spoiled every time I go. A couple other studios in town also do a class or two by donation. Check websites for details. I like these pay as you go options because then I don’t have to pay for the weeks I’m sick or out of town.